To Cite: Mavridis I N. Mavridis’ Area Targeting for Deep Brain Stimulation in Psychiatric Disorders: Stereotactic Microanatomy and Technical Aspects, J Minim Invasive Surg Sci. 2016 ; 5(2):e59553. doi: 10.17795/minsurgery-34147. Context: The human Nucleus Accumbens (NA) constitutes nowadays a target of deep brain stimulation (DBS) for selected patients mainly suffering from some psychiatric disorders. Mavridis’ Area (MA) of the human brain is the most reliable stereotactically standard part of the NA, regardless of side or gender. Primary purpose of this review article was to discuss the MA as a stereotactic microanatomic target for NA DBS application, emphasizing on technical aspects of targeting the MA. Evidence Acquisition: A detailed search of the current literature regarding MA was applied. The critically reviewed literature was then used to discuss the MA as a stereotactic microanatomic target for NA DBS application, emphasizing on technical aspects of targeting the MA. The suggestion of future research directions was also aimed. Results: Following the currently used trajectory through the anterior limb of the internal capsule (ALIC) in combination with the principles of the ‘port model’, a DBS electrode placement within the NA, targeting the MA, is feasible. MA could be the target area of one, only, of the electrode contacts, preferably contact 1 or 2. It could be also the target area for contact 0 in ALIC DBS and even the target for a combined NA-ALIC DBS. MA is the first and most representative example of the evolution of stereotactic anatomy into stereotactic microanatomy, in order to serve the development of the field of stereotactic microneurosurgery. Conclusions: MA is nowadays the most accurate stereotactic anatomic guide for targeting the human NA. It is a representative example of how stereotactic microanatomy could serve the development of stereotactic microneurosurgery. Following the currently used trajectory through the ALIC, a DBS electrode placement within the NA, targeting the MA, is feasible, allowing either NA or ALIC stimulation. Simultaneous stimulation of the NA and ALIC is also possible with this application. The human nucleus accumbens (NA), located at the basal forebrain, is a major part of the ventral striatum and belongs to basal ganglia of the brain. Functioning as a limbic-motor interface, it is connected to limbic and extrapyramidal motor systems (1-6). Figure 1 summarizes the main cortical and subcortical brain structures connected to the human NA (1, 7). The NA is involved in some of the commonest neurologic and psychiatric disorders and constitutes a target of stereotactic and functional neurosurgery for selected patients. These patients mainly suffer from refractory major depression, obsessive-compulsive disorder (OCD), Tourette syndrome and some kinds of addiction (such as heroin addiction and alcoholism), as well as, more recently, anorexia nervosa. NA Deep Brain Stimulation (DBS) is nowadays the main neurosurgical intervention used for treating these patients, with encouraging results (1, 2, 4, 5, 8-11). Mavridis’ Area (MA) (or area M) of the human brain is the stereotactic area defined by coordinates [X, X′, Y, Y′, Z, Z′] = [6, 9, 2, 2, -0.8, -2], with the anterior border of the anterior commissure (AC) at the midline defining the stereotactic reference point with coordinates [X, Y, Z] = [0, 0, 0] (1, 12-17) (Figure 2). It is the most reliable stereotactically standard part of the human NA, regardless of side or gender (1, 13, 16). MA is the result of mathematical analysis of clinically significant stereotactic coordinates, in a way that mathematical accuracy was translated into microsurgical accuracy (16). 1, nucleus accumbens; 2, head of the caudate nucleus; 3, putamen; 4, anterior limb of the internal capsule; 5, frontal horn of the lateral ventricle; 6, claustrum; 7, corpus callosum; 8, frontal lobe (white matter); 9, insula of Reil (cortex); MA, Mavridis’ area; X, Y, Z, stereotactic coordinates. Nowadays, MA is the most accurate stereotactic anatomic guide for targeting the human NA (17). It offers a compass for neurosurgeons given the relative variety of NA target coordinates used in the past by several authors (13). Primary purpose of this article was to discuss the MA as a stereotactic microanatomic target for NA DBS application, emphasizing on technical aspects of targeting the MA, as well as to suggest future research directions. A detailed search of the current literature regarding MA was applied, primarily based on articles from the PubMed and Google Scholar databases. Key words for this searching was “Mavridis’ area”. Articles regarding human NA DBS applications and reporting target coordinates were also searched, with emphasis on those describing a target area relevant to MA. The critically reviewed literature was then used to discuss the MA as a stereotactic microanatomic target for NA DBS application, emphasizing on technical aspects of targeting the MA. The suggestion of future research directions was also aimed. Following the currently used trajectory through the anterior limb of the internal capsule (ALIC) (1, 18), in combination with the principles of the ‘port model’ (safe navigation model) which were recently described in stereotactic anatomic studies (1, 19, 20), a DBS electrode placement within the NA, targeting the MA, is feasible. Regarding the electrode models that have been used for human NA DBS so far, it should be mentioned that these include Medtronic (Medtronic, Inc., Minneapolis, MN) electrode models 3387, 3389 and 3387 IES (1, 21). They all have a diameter of 1.27 mm and four contacts (poles) (22, 23). Models 3387 and 3389 have 1.5 mm contact length and distance between contacts 1.5 mm and 0.5 mm, respectively (22). Electrode model 3387 IES has 3 mm contact length and 4 mm contact spacing (23). According to these technical details and considering the MA dimensions and its location within the NA (Figure 2), we see that it could be the target area of one, only, of the electrode contacts, preferably contact 1 or 2 (0 is the deepest one). Furthermore, the Medtronic (Medtronic, Inc., Minneapolis, MN) electrode model 3391, used for ALIC DBS in the treatment of chronic, severe and treatment-resistant OCD, has 3 mm contact length and 4 mm contact spacing (24). The manufacturer suggests that the trajectory to the target for the deepest lead contact should follow the course of the ALIC toward the point where fibers of the AC cross the ALIC. Interestingly, the suggested range of coordinates for these landmarks is [X, Y, Z] = [5 to 10, 0 to 5, -5 to -1], using the AC as stereotactic reference point (24). We see that MA is included in this range area. Consequently, it could be the target area for contact 0 in ALIC DBS. Additionally, MA could be the electrode target for a combined NA-ALIC DBS, which has been repeatedly described for treating psychiatric disorders. It should be further mentioned that stereotactically standard area H of the human NA has been previously proposed as another (more restricted) target area for this purpose (1, 15). The new aspect of this article is that it offers a concise review of the current knowledge regarding MA, five years following its identification, as well as a focused analysis of technical aspects of the currently used hardware for NA DBS in relation to MA. The specific methodology which led to the discovery of MA has been previously described (15, 25). Furthermore, comparison of different applied methods for studying NA stereotactic anatomy, as well as their results, has been also previously presented (15). Due to this point that a precisely in target electrode placement is of paramount importance in DBS of deep brain structures, the use of MA, of course with other factors such as a careful preoperative trajectory planning together will help in minimizing the chances of missing the target. 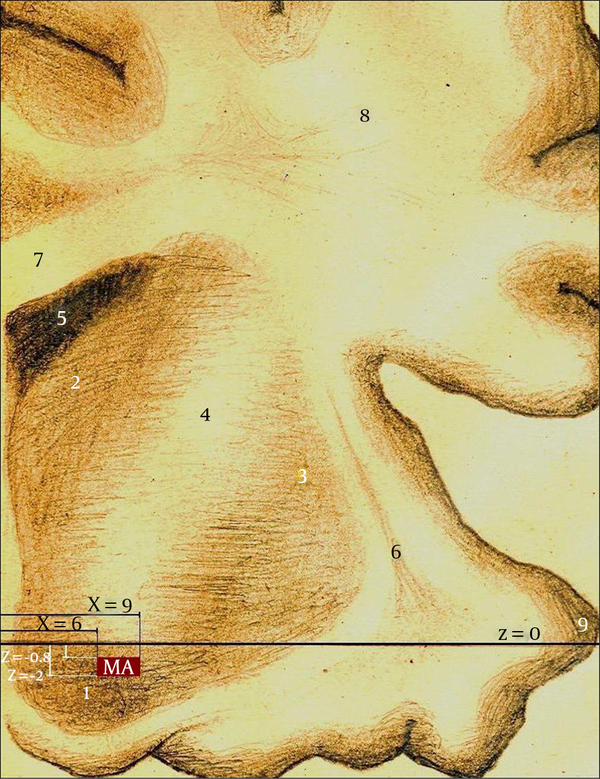 MA is the first and most representative example of the evolution of stereotactic anatomy into stereotactic microanatomy, in order to serve the modern necessities of stereotactic and functional neurosurgery and specifically the development of the field of Stereotactic Microneurosurgery (17). Future clinical applications of NA DBS, an increasingly used minimally invasive operation, are expected to improve our knowledge of the microenvironment of the NA, as well as the way we approach its targeting and determine stimulation parameters. A future evolution of electrodes’ characteristics could offer smaller lead implants enabling neurosurgeons for even more selective stimulation of specific brain areas, such as nuclear parts instead of whole nuclei. Smaller leads could also contribute in further minimization of specific implantation-related complications such as intracerebral hematomas. Nowadays, five years after its discovery, MA is the most accurate stereotactic anatomic guide for targeting the human NA. It is the first and most representative example of the evolution of stereotactic anatomy into stereotactic microanatomy, in order to serve the development of Stereotactic Microneurosurgery. Following the currently used trajectory through the ALIC, a DBS electrode placement within the NA, targeting the MA, is feasible, allowing for either NA or ALIC stimulation. For NA DBS, either contact 1 or 2 should be located at the MA, whereas for ALIC DBS, contact 0 has to be located at the MA. Simultaneous stimulation of the NA and ALIC is also possible with this application. 25. 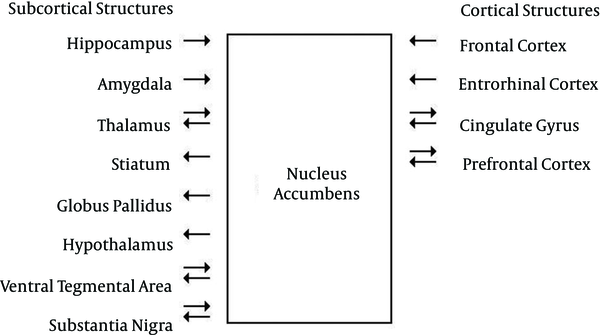 Mavridis I, Boviatsis E, Anagnostopoulou S. Stereotactic anatomy of the nucleus accumbens: analyzing coordinates. 14th European Congress of Neurosurgery.